Several members of Congress were arrested after participating in an immigration "sit-in" on Capitol Hill demanding that House Republicans act to pass immigration reform. Reps. John Lewis, D-Ga.; Keith Ellison, D-Minn.;. Charles Rangel, D-N.Y.; Jan Schakowsky, D-Ill.; and Luis Gutierrez, D-Ill., were among the lawmakers arrested by the Capitol Police for blocking a street near the Capitol. The representatives are calling on Congress, particularly Republicans, to push immigration legislation forward. The Senate has passed a bill that includes amped up border security. House Democrats have unveiled a plan with a path to citizenship for the estimated 11 million immigrants living in the U.S. illegally. But it's unclear if the GOP-led House will ever pass legislation. They were arrested on charges of "crowding, obstructing, and incommoding" after a large group blocked First Street near the Capitol. In addition to the members of Congress, the Washington Post reports at least 100 others were arrested. A spokeswoman for Lewis, whose district covers Atlanta and some of its neighboring areas, said was arrested Tuesday afternoon during the Camino Americano Rally for Immigrant Dignity and Respect. 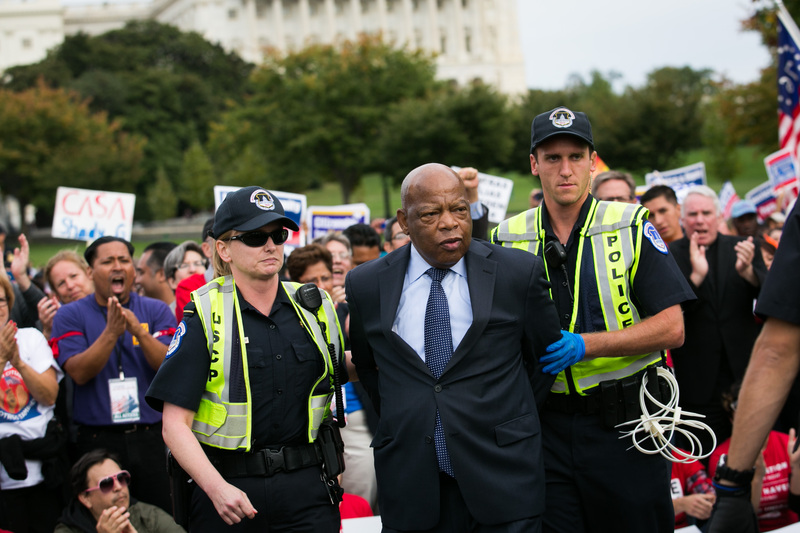 Jones says Lewis was taken into custody in front of the U.S. Capitol, near the reflecting pond. Jones says Lewis has now been arrested five times as a member of Congress. Lewis was arrested twice at the South African embassy protesting apartheid and twice at the Sudanese embassy protesting genocide in Darfur. Jones says Lewis was also arrested more than 40 times during the civil rights movement.